On Thursday night one of the resident horses at the Redwings Piggots site in South Norfolk was confirmed to have strangles after a routine check found it had nasal discharge. The horse, a 6-year-old bay gelding, was immediately put into isolation at the charity’s quarantine centre and all movements between sites were suspended as a precaution. 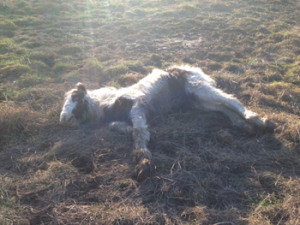 Another horse was found showing symptoms the following day and is now also in quarantine. All sites and areas where the contact may have happened are now locked down to prevent any further spread and the Redwings veterinary team are running tests on any horses who may have had contact with the infected equines to ensure they are isolated and treated if required and using their extensive records to find possible routes of entry. Strangles is a highly contagious infection of the upper respiratory tract (nose and throat) that spreads very rapidly through contact with infected mucus, either directly between horses or indirectly with contaminated items such as feed and water containers. It can be infectious even when symptoms are not showing which is why is it very challenging to contain. 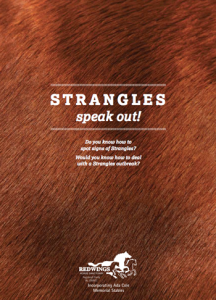 Although strangles is usually not fatal it can cause real distress and can result in large abscesses that prevent swallowing and restrict breathing. 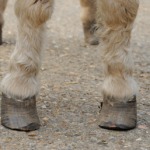 It is endemic in the UK horse population and is particularly common in immunocompromised animals. As a result Redwings’ Reception Centre staff deal with it routinely in the rescue and neglect cases they take in but this is the first time in 23 years there has been a case within the charity’s resident herd. Both horses are now under treatment and are making good progress. The Sanctuary is actively monitoring and testing other horses in its resident herd who may have been in contact with the infected equines, and it has promised weekly updates via its website www.redwings.org.uk. All Redwings visitor centres are open as normal and while any rehoming has been temporarily suspended it is hoped this will be reinstated very soon. It has been announced by the EU Commission that the European Equestrian Riding Helmet standard (BS)EN1384 is to be withdrawn from the Official Journal of the European Union (OJ) at its next publication. This means that hat manufacturers will no longer be able to CE mark their hats using this standard and will need to recertify to a specification currently being developed. The withdrawal of the standard has no effect on riding hats already on the market. Once a hat has been manufactured to a standard it will not become “non-standard” after withdrawal and can continue to be sold and worn. If riders have hats certified to the EN1384 they can continue to use them unless stated otherwise by rules of competition. The draft proposal for the revision to EN1384 has to go through the laborious procedure of comment and review and it is still unclear when the final version will be published. An interim specification is being developed by a group of EU test houses and notified bodies (VG1) that will span the gap with a new specification and this is now available. British Eventing – British Eventing will permit (BS)EN1384 hats in 2015 but not thereafter. All hats will be retagged in 2016 at which stage no hats made solely to (BS)EN1384 will be tagged or permitted for use. Riding Clubs – British Riding Clubs will permit (BS)EN1384 hats in 2015 but not thereafter. All hats will be retagged in 2016 at which stage no hats made solely to (BS)EN1384 will be tagged or permitted for use. Pony Club – will permit (BS)EN1384 hats in 2015 but not thereafter. Full details of the revised Hat Tagging procedure will be communicated out to the Membership and Volunteers shortly. Equifest 2015 – Your Qualification Starts Here! As the most anticipated equestrian event of the year fast approaches, make sure you pencil Equifest into your diary! Held at East of England Showground, Peterborough, August 12th to 16th, the event is not to be missed and promises to be an action packed five days. An exciting new development has now been confirmed for this year’s event with Equifest teaming up with Ponies (UK) to provide joint qualification. Explains Betsy Bryan of Equifest: “We are delighted to announce that this season all qualifications for Equifest will also qualify the combination for the Ponies (UK) Winter Classic – March 28th and 29th and the Ponies (UK) Supreme Championships on July 24th to 26th. “The idea of the dual qualification is that Equifest competitors can now qualify for three shows with one qualification – Equifest, Ponies (UK) Winter Classic and the Ponies (UK) Supreme Championships. 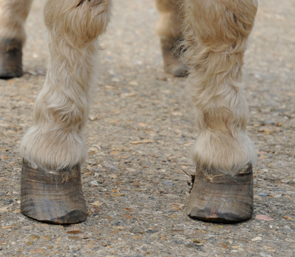 Both of the Ponies (UK) Championships are held at Bury Farm Equestrian Centre in Buckinghamshire. In order to qualify for the three championships, competitors need to get either their Equifest Qualification Card or their Ponies(UK) Qualification Card signed and send a copy of the card in with their entries for the championships. Equifest hope the new qualification will bring a new competitor base to all the shows, encouraging more riders to attend and give Equifest competitors added value to their one qualification. In any instance where there is a slight incompatibility of wording, P(UK) rules will take precedence – so competitors need to check the wording in the P(UK) Rule Book – www.poniesuk.org. Hertfordshire’s Ben Maher and the British Bred 10 year-old chestnut mare Diva II, owned by Tatiana Korsakova, made their mark in Wellington, Florida Sunday 1st February when they took 2nd place in the Rolex FEI World Cup Qualifier. Week 4 of the 2015 Winter Equestrian Festival saw many of the world’s top riders come forward to contest the events first CSI 5* Grand Prix. Taking place under floodlights, the impressive arena looked magnificent and with almost 5,000 supporters surrounding it, the atmosphere was electric. Course designer Guilherme Jorge had built a strong technical course for the forty five strong field which saw only ten of them jump clear in the first round. One of the ten came in the form of Ben, who as the sole Brit through to the jump off, was joined by other top riders including Eric Lamaze, Kent Farrington and Marie Hecart to name just a few. Jumping another foot perfect clear, Ben stopped the clock in a time of 40.56 seconds. Mid field saw Marie Hecart for France with Myself de Breve put in the only other double clear of the competition. Managing to finish almost two seconds faster in a time of 38.61 seconds, she claimed the title as her own relegating Ben into 2nd position. The jump off was most certainly an exciting one, with riders giving it their all in terms of trying to catch Marie and Ben on the clock. Taking turns which left nothing to spare and opening up their horses whenever they could, the risks taken were just too great for some as both Eric Lamaze and Kent Farrington incurred 4 faults each despite proving that the leaders times could be beaten. It was Eric Lamaze for Canada with fine Lady 5 who take 3rd place with their time of 36.54 seconds and Kent Farrington with Willow for the USA who stopped the clock at 37.79 seconds. Laura Renwick (40) from Maldon, Essex partnering Rembrandt Blue a 10 year-old grey gelding owned by David Rogers were victorious in the 1.45m Master Tour Grand held Sunday 31st January as part of the CSI 2* Mijas show. Thirty-eight starting combinations came forward trying to get their share of the €30,000 prize pot available. With seven riders making it through to the jump off, Laura and Rembrandt Blue a took the lion share after jumping double clear in a time of 34.22 seconds just over half a second quicker than Germany’s Andreas Brenner on Cronos 17 and third place went to Italy’s Luca Maria Moneta on Jesus De La Commune.